Why can some interest groups influence policy-making while others cannot? Even though this question is central to the study of politics, we know little about the factors explaining interest group influence. Understanding lobbying success should be of particular concern to scholars of European politics since the European Union constitutes a promising political opportunity structure for organized interests. This book sheds light on the impact of interest groups on European policy-making and makes a major contribution to the study of both European Union politics and interest groups more generally. Klüver develops a comprehensive theoretical model for understanding lobbying success and presents an extensive empirical analysis of interest group influence on policy-making in the EU. The book relies on a large, new and innovative dataset that combines a wide variety of data sources including a quantitative text analysis of European Commission consultations, an online survey of interest groups, information gathered on interest group websites and legislative data retrieved from EU databases. 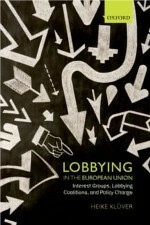 This book analyzes interest group influence across 56 policy issues and 2,696 interest groups and shows that lobbying is an exchange relationship in which the European institutions trade influence for information, citizen support and economic power. Importantly, this book demonstrates that it is not sufficient to solely focus on individual interest groups, but that it is crucial how interest groups come together in issue-specific lobbying coalitions. Lobbying is a collective enterprise in which information supply, citizen support and economic power of entire lobbying coalitions are decisive for lobbying success.